Commonly called Wandering Jew, Tradescantia zebrina (=T. pendula; Zebrina pendula) is a popular houseplant in the spiderwort family (Commelinaceae) grown for its variegated foliage. 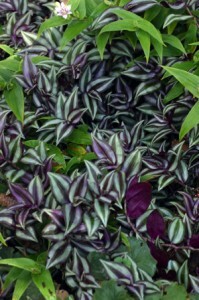 There are other houseplants with this same common name (including the similar looking, but more robust, all green T. fluminensis); this one has attractive striped purplish-green leaves. This is the plant for the wanna-be-green-thumb! It is very tough and will thrive in almost any conditions indoors. This tender perennial native to southern Mexico and Guatemala can be grown outdoors in mild climates (zones 9-11) where it does not freeze or as an annual where winters are cold. 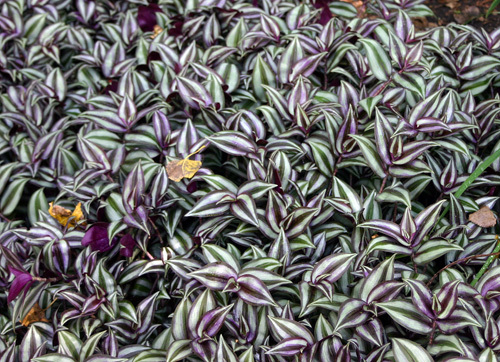 Tradescantia zebrina makes a good temporary groundcover (it is not hardy in the Midwest), here mixed with toad lily (Tricyrtis). This creeping plant makes a good groundcover 6-12” high. It has succulent stems with ovate to lanceolate leaves clasping the stem. 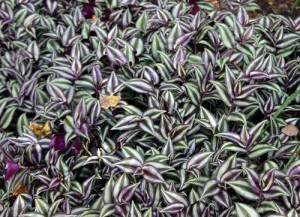 The upper leaf surface is green to purple with two wide, silvery-white stripes, while the lower leaf surface is a uniform deep magenta. If you look closely you can see the fine hairs along the leaf margins and may note that the surfaces seem to sparkle in bright light. Color intensity is greatest in full sun in our area, but in more southern locations too much sun will cause the colors to wash out. In low light conditions, stems lose lower leaves and the leaves lose much of their coloring. The stems will branch or root at the nodes, and ascend at the flowering tips. The stems break easily at the nodes. The watery, mucilaginous sap can cause skin inflammation in susceptible individuals. The foliage ranges in color from green to purple depending on light exposure. The inconspicuous flowers arise in the leaf axils. The inconspicuous boat-shaped flowers are white to lavender. 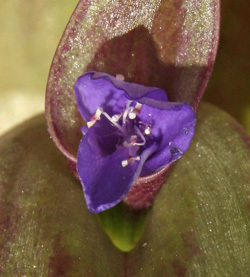 Like other tradescantia flowers, they have 3 petals and prominent yellow anthers. Plants may bloom sporadically throughout the year, although they rarely appear on indoor plants. This plant does best in light shade outdoors, but bright light indoors. 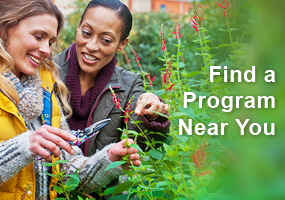 It can be moved outdoors after all danger of frost has passed, but be sure to acclimate it gradually to brighter conditions to prevent sunburn. 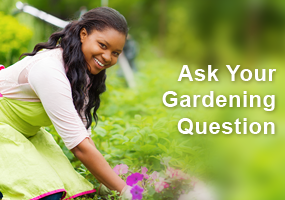 Provide regular water, but this plant does well if the soil is allowed to dry out between waterings. 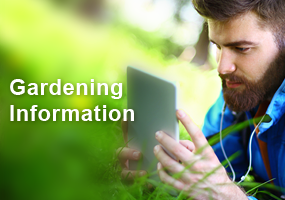 It tolerates heavy pruning, and pinching the plants will promote denser foliage. Any leggy growth can be pruned off as cuttings for propagation. T. zebrina is a good trailing plant for containers. T. zebrina makes a good trailing plant for seasonal containers or an underplanting with larger houseplants, such as a hibiscus standard, plumeria, or ficus tree. It can be used to fill in at the base of other tall tropicals such as cannas, bananas and elephant ears, either in containers or in the ground. Or treat it like an annual and plant cuttings in the ground for the growing season once all danger of frost has passed. 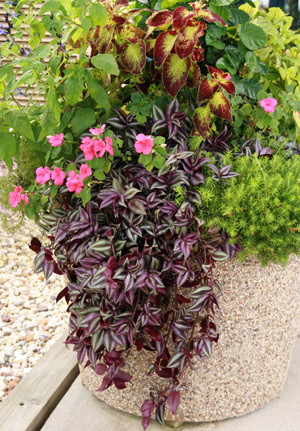 It is fast-growing, with trailing stems that can become straggly (especially in low light conditions), so you may want to renew containers by adding tip cuttings back in the top periodically. Many people acquire this plant from friends or plant sales as each segment is capable of producing a new plant. T. zebrina is easily started from cuttings which root readily in water or moist soil. It can also be layered, as roots form at the nodes when in contact with moist soil. A few cultivars, such as ‘Purpusii’,‘Tricolor’ or ‘Quadricolor’, are sometimes mentioned, but they don’t seem to differ significantly from the species. I learned that this plant will make a good ground cover.